Venture capital has been tremendously successful in the United States. In some ways, it has almost been too successful in that many entrepreneurs think traditional venture capital is the only path to success. That is not true. This article in the Harvard Business Review by Diane Mulcahy of the Kauffman Foundation helps explain some of what is good and bad about venture capital. These six myths are from Ms. Mulcahy while the commentary afterward is mine. Venture Capital is the Primary Source of Start-up Financing. 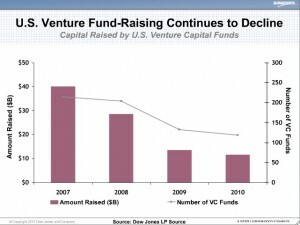 Fewer than 1% of US companies have raised capital from traditional venture capitalists, and it is probably dropping. It costs less to start a company today than twenty years ago, so fewer entrepreneurs are forced to seek capital from VC’s. More companies are able to finance their growth from their customers. Angel investing and crowd-funding are now entering the picture as well in a bigger way; these will probably evolve to be capital sources with promise and with pitfalls. VC’s Take a Big Risk when They Invest in Your Start-Up. Venture capitalists are looking for home-run investments and they do not care if they have investments that return nothing or very little. Partly, this is because of their financial incentives at play. Ms. Mulcahy mentions how little of the money comes from the VCs themselves versus the institutions and endowments that invest through such venture firms. Every company founder should ask himself or herself whether taking on a partner with different motivations that is going all-in all the time is the best answer for his or her company. Most VC’s Offer Great Advice and Mentoring. Sometimes this is true, but it is often not true. Every situation is different and founders should pay close attention to their exact circumstances. VC’s Generate Spectacular Returns. For over a decade, venture capital returns have been negative or close to zero, not even close to what could have been achieved through public market investments. The top-tier firms perform consistently well (please see this post on consistently persistent performance), but many others have returns worse than zero. At a VC firm, this will put tremendous pressure on them eventually to get good returns or close up shop. And that pressure will flow downhill to company founders. In VC, Bigger is Better. Investment returns often decline when a flood of money enters the field — this was the case in the last twenty years in venture capital. And, there are studies that show that the larger the VC fund, the lower their returns. It can help a small entrepreneur to be with a big, well-known venture firm, but it doesn’t help the big firm’s investment returns. VC’s Are Innovators. The industry has grown, but I often hear the investors in venture funds complain about the lack of innovation that Ms. Mulcahy explains. So, don’t try and break the conventional ways of doing things when you are working with traditional venture capitalists. Founders should consider all of their options when looking for investment capital. Venture firms are the perfect answer for many founders. For many others, there are other sources of capital that are better suited to their company and their particular situation. Like many things in life, finding the optimal investor for your company is often about putting in the hard work to find the investor that is best aligned with you and your company. Built to Last or Built to Flip?